31 days to 2018, YOUR donation means more horses can be helped! On the 11th Day, there was Tilly, Mazie, Hildalgo, Smokey, Petie and Pumpkin! Today's story includes several horses, previously rescued, and they fell back on AAE this year as a sort of a safety net. Too many times, people adopt a horse, and for one reason or another, and they are unable to keep the horse. That's how many end up here to begin with. One of our disappointments in recent years is that AAE's failed adoption rate has grown to about 10 percent. Though AAE strives to match horses with forever homes, sometimes the situation is beyond anyone's control. Other times, it seems people far underestimate the effort, responsibility, commitment, and cost of horse ownership. Sometimes the adopter overestimates or overstates his/her abilities, resulting in a mis-matched adoption. Sadly, these things happen far more often than they should. Tilly and Smokey came back to AAE after their young owner was no longer able to properly care for them. Both of these gentle souls had been adopted, and twice they were returned. Smokey originally came to AAE when his former owner was unable to move him to new property. He had been neglected. Then his original adopter had a terrible accident and due to a severe injury, she was physically unable to care for him. Now back, Smokey is doing well. He's still at AAE, getting lots of love from volunteers. He enjoys the pasture and his herd, but he really enjoys attention from his human partner. Smokey really needs a forever commitment from his next person. He needs a home to grow roots and live out his life without further separation. He bonds strong with a buddy and the separation is hard on him. Smokes will stay at AAE until we can assure his next move is his last move! Tilly originally came to AAE after seizure in a neglect case. She had a young foal, and the two were in extremely poor condition.She rehabbed beautifully and went out on adoption. 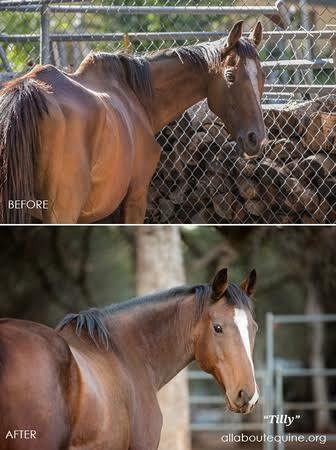 Her original adopter pushed her too hard, too fast to make her a riding horse - though she promised to take it slow and give her time to adapt to her new home and build trust. Tilly came back a bucking horse. Fortunately, Tilly truly seems to have found her special person; it was love at first sight. This one feels like forever! Mazie came to AAE as a yearling from a collaborative auction rescue. She developed into an aMAZIEng lil filly. She spent time at the Monty Roberts International Learning Center and impressed her student with her personality and brains. 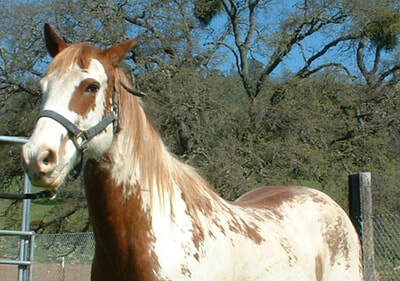 Her adopter brought her into her life after retiring her other horse. Sadly, her other horse passed, and she decided she didn't want to be in horses any more. So Mazie came back to AAE, and she recently met her new mom, who seems the perfect fit for forever with Ms. M.
Hidalgo came to AAE when his prior owners were downsizing and moving to a smaller property. He came in with hoof issues and a bit stand-offish, but he quickly became a volunteer favorite. He was an older guy, and had some limitations because of his hooves, and his soft topline. He was adopted to be buddies with a couple other horses, but unfortunately, in his new environment, he grew a big youthful attitude and thought he was king of the hill. Sadly, one of his pasturemates had a very arthritic knee, and Hidalgo was too much a threat to his safety. He came back for a short while before moving on to a new home to be a buddy to a big Percheron boy. Finally, two AAE favorites returned recently, but not for long. Petie and Pumpkin are two minis that were adopted a few years ago, but due to a family health crisis, they came back. Fortunately, they practically had a home waiting for them with one of our volunteer families, and the opportunity to become their new home was a dream come true. Fortunately, five of six horses that returned this year have been adopted again. We hope this is their last stop! Our fingers stay crossed that the right situation comes along for Smokey. Before you adopt or purchase a horse, please take time to consider the big picture. Consider the time it takes to care for the horse, the expense of horse ownership, the knowledge you need for proper care, handling and training. Consider t-he effort it takes to properly care for and provide for a horse. Consider that housing can be a challenge if you don't have property or you have to move. If you can't afford vet care, don't gamble with a life. Consider the disruption it causes a horse when it's detached from it's home, it's people, and it's equine family. Think also about the impact to AAE and other organizations or families that provide that safety net for your horse. Consider the impact to space, care and/or monetary resources. If you would like to help more horses get the help they need, please donate here.